Further information can be found in the FAQ, under Strategies and under Saisonality. A detailed introduction to seasonality and seasonal investing is available in this May, 2005 article (PDF 2,5MB - 0,5MB) from Traders Magazine. Please see our risk disclaimer. 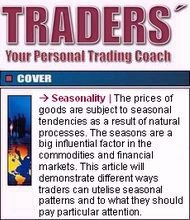 Detailed information about seasonality can be found in this Traders Magazine article (PDF 2,5MB - 0,5MB) from May, 2005.